Yet, admitting an unpleasant truth can be difficult. It used to be nearly impossible for me to say, “I’m sorry” to someone when I had done something I should not have done, or when I had failed to act. I felt if I admitted I was wrong I would be declaring that I’m a bad person — and I just couldn’t bear that image of myself. Well into adulthood I struggled with the inability to admit my faults and sins, without being overwhelmed by shame. But this cycle of shame began to change for me a few years back as I spent time working through Beth Moore’s Bible study entitled, Breaking Free. My cousin, Kathy, bought me the entire 10-week series on DVD. As I watched and participated in the study I discovered God’s tenderness for me. I had not encountered such tenderness, completely free of fault-finding or expressions of disappointment and displeasure, from any human authority figure before. For the first time in my life I began to feel totally safe in God’s presence, safe enough to admit to him the truth about my sins and willfulness. Shame is about humiliation and fear. But with God, we have nothing to fear. He is tender, compassionate and forgiving. He will never humiliate us. Instead, he yearns for us to trust him with the truth we are afraid to admit and to let him pour his love into our hearts. I actually feel good now when I unload my sins before God. Saying, “I’m sorry,” has become a liberating experience instead of a debilitating one because I discovered God has a tender heart for me. 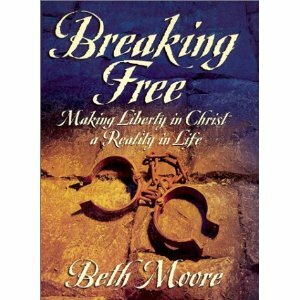 In Breaking Free Beth Moore provides a helpful list of attitudes and actions that can lead us into sin. I use this list when I confess my sins to God. It helps me uncover recurring patters of sin in my life. You may find this list (which I’ve slightly amended, below) helpful, too. *In the story of the prodigal son the older brother exemplifies this behavior. Check out Luke 15:25-32 for a vivid example of legalism. Keep in mind our heavenly Father rejoices when, like the prodigal son, we come to our senses about our sins. He, like the prodigal’s father, longs for our return and runs to meet us with open arms as we make our way back from a far country ((Luke 15:20). So, after you’ve confessed the truth about your sins before God, it is vitally important to accept and own his forgiveness. Jesus tells a parable which precedes the one about the dissolute younger son in which he compares God to a man who goes out of his way to search for a lost sheep and doesn’t quit until he finds it. And when he does find it, he places it on his shoulders and carries it home, rejoicing. (15:3-7) God calls us to see ourselves in the lost sheep – and to see him in the man who will not give up until his wayward sheep is found. If you should ever doubt God’s forgiveness of your sins, turn to these stories for reassurance. If you find you are still troubled by remembrance of sins, seek out your pastor, or to a brother or sister in Christ, who is skilled in understanding the theological and psychological consequences of sin and guilt. Remember: the Lord loves sinners and seeks out the lost so he can bring them back home. Next week: Confessing our standing before God. This entry was posted in Prayer and tagged Beth Moore, forgiveness, Luke 15:11-32, New Testament, prayer, prayers of confession (sins), prodigal son, shame, sin. Bookmark the permalink.